VLC is an excellent media player but I just get a VLC not playing MKV issue. When I play MKV on VLC, problems like VLC MKV grey screen, skipping keep popping out. Can VLC play MKV? How to successfully play MKV in VLC? Any ideas? Does VLC play MKV files? Recently I downloaded some MKV files and tried to play but it seems that VLC won't play MKV anymore since it just loads the file forever... I've already tried rebooting my computer, deleting the preferences and reinstalling VLC but I’m keeping receiving VLC stuttering and freezing problem when playing MKV HD files. Anyone who can help with this? VLC media player is a widely-used player that plays various video and audio formats. However, when you visit a forum, you can see users seeking for solutions to how to fix VLC not playing MKV files. While claiming to support MKV on its official site, we find, much to our regret that VLC won't play MKV. For example, when importing MKV media contents to VLC, we will experience problems like: VLC stuttering, skipping or freezing when playing 1080P HD MKV; MKV choppy playback or MKV grey screen; VLC just loads MKV forever... How to play MKV file smoothly? Take it easy, learn how to solve MKV files not playing in VLC below. 5KPlayer - Use the free MKV video player to avoid VLC won't play MKV problems. 100% free to play MKV, MTS, M2TS, AVCHD videos on your Windows and Mac flawlessy! * You are using the latest version of VLC media player. * The MKV video files you'd like to play are not corrupted. Try other players installed on your computer to check if the source MKV media files are damaged. Rather than asking "Does VLC play MKV? ", "How can I import MKV to VLC? ", "How to stop VLC freezing", why not switch to another media player as so many good players are available out there. Among those you can try, an all-around free MKV player named 5KPlayer is definitely worth a shot. It intelligently integrates free (MKV) HD video player, music player, AirPlay media streamer into one. For users who prefer to stick with VLC and do not want to convert MKV to VLC supported formats, they are left with no choice but to tweak some settings with VLC itself or disable the hardware decoding. You may try this way but it does not always work out and you may get confused if setting stuff is totally new to you. When loading MKV files to VLC on Mac/ Windows, it reports error message "unidentified codec: VLC could not identify the audio or video codec." This is because MKV is a container format that may contain the media player unsupported video or audio codec. To solve VLC not playing MKV problem caused by unaccepted media format, you can install MKV codec pack or convert MKV to the best media format for VLC player using MKV video converter. Though VLC has trouble playing MKV files, it does perfectly handle an impressive amount of media and input formats, like MP4, MOV, AVI. To fix VLC won't play MKV problem once for all, why not convert the MKV files into a more VLC-friendly format? 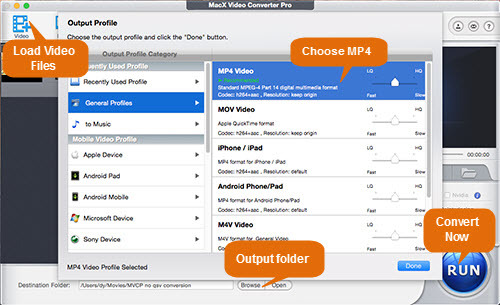 To that end, here a MKV to VLC converter named MacX Video Converter Pro is highly recommended as it offers users an one-stop solution to VLC not playing MKV issue. This VLC video converter can easily convert 1080p, 720p, even 4K HD formats, like AVCHD, MTS, M2TS and MKV into MP4, MKV to AVI and other VLC supported formats, with 100% original quality reserved. Learn how convert MKV to VLC for smooth playback below. Step 1: Free download this MKV to VLC converter on Mac, or windows users, just go to the windows version. Launch it and click "Add File" to load the MKV video files you want to play on VLC. Step 2: Choose one of the formats supported by VLC. You are suggested to select one VLC friendly format, like MP4, AVI, FLV, WAV etc to ensure hassle-free playback. Step3: Click the output folder you want to save the output video by clicking "Browse" button. Step 4: Click the "RUN" button to start to convert MKV to VLC videos on your Mac. Note that this program also serves as a good YouTube to VLC converter, with which you can download HD MKV, MTS, M2TS and SD videos to play on VLC player. How to fix audio video out of sync problem when playing video in VLC? Here teaches you the methods to quick solve VLC audio syncing problem in video playback. MacX Video Converter Pro is the best MKV video converter that can easily convert MKV to best format for VLC with original quality and fast speed. This feature-rich video converter also can convert 1080p, 720p, even 4K HD formats, like AVCHD, MTS, M2TS to VLC supported formats.